With over 400,000 units sold in 2017, the - just let that sink in for a moment. Toyota's compact crossover SUV has toppled sales giants including the Honda Civic and CR-V, the upstart Nissan Rogue, and even Toyota's own Camry and Corolla. 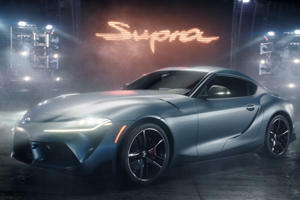 This is quite possibly the most important vehicle launch of the year, so Toyota couldn't muck about when it came to , which now arrives as a 2019 model. We were invited to Carmel Valley, California, to drive the all-new 2019 RAV4 in several of its seemingly endless trim levels. Our drive route featured sunny California beach roads, steep off-road trails, and even the occasional Starbucks parking lot, all of which provided a realistic foray into the life of the average RAV4 owner. Right off the bat, Toyota hasn't wasted its time giving the RAV4 a subtle facelift - this is clearly an all-new design. Toyota wanted the 2019 RAV4 to bring back a more rugged SUV appearance, reflecting its off-road credentials. The RAV4 looks dramatically different depending on which trim level you choose - XSE, for example, boasts a sporty appearance while Adventure exudes a more rugged vibe. Just take one look at those squared-off wheel arches and you get a sense of how rugged the RAV4 can be. 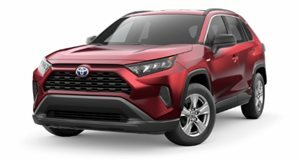 The designers even drew inspiration for the grille design from Toyota's trucks - just think of the RAV4 as a sort-of 4Runner-lite. We must also commend Toyota for giving the RAV4 an assortment of stellar color options - some of our personal favorites include Lunar Rock and Blue Flame (). The Adventure and XSE Hybrid trims can even be optioned with an alternative roof color, like the old FJ Cruiser. Inside, Toyota continues the rugged design, with several available themes. As with the exterior design, the interior can change drastically depending on what trim level you buy - the Adventure trim, for example, has a leather interior with orange accents while the XSE boasts sporty blue stitching. No matter which trim level you choose, the RAV4's cabin is very nicely laid out. The RAV4 can hold up to eight cups/bottles and charge up to five USB devices. Toyota has also added clever storage areas throughout, including a handy shelf in front of the passenger seat, so finding a spot for all of your miscellaneous items should be no challenge. In the rear seats, passengers receive an adequate 37.8 inches of legroom and the rear seats themselves are a comfortable place to sit. Depending on trim level, the RAV4 can be relatively spartan or packed with features. Available options include a 360-degree camera, digital rear-view mirror, heated and ventilated front seats, heated rear seats, panoramic moonroof, and JBL premium audio. The base infotainment system uses a seven-inch touchscreen with Apple CarPlay included, although Toyota still hasn't added Android Auto. Stepping up to the eight-inch screen on higher trim levels adds HD and satellite radio as well as built-in Navigation. Although Android Auto is not available, Android users will be able to connect Amazon Alexa to control the car. Toyota has also included two different gauge clusters, depending on trim level. The base 4.2-inch multi-information display was perfectly acceptable, making us wonder why Toyota even bothered with the larger 7.0-inch display. The RAV4 doesn't skimp on safety either. All RAV4 trim levels include Toyota Safety Sense 2.0, which bundles a pre-collision system with pedestrian detection, road sign assist, lane trace assist, lane departure warning, automatic high beams, and adaptive cruise control with stop-and-go. Blind-spot monitoring with rear cross-traffic alert is also available. Toyota has given RAV4 buyers two drivetrain options. The base engine is a 2.5-liter four-cylinder producing 203 horsepower and 184 lb-ft of torque. Power in the gas model is sent to either front- or all-wheel-drive through an eight-speed automatic transmission. Fuel economy varies slightly depending on trim level, so expect to see between 26 to 27 mpg in the city, 32 to 34 mpg on the highway, and 27 to 29 mpg combined. The hybrid model is also powered by a 2.5-liter four-cylinder engine producing 179 hp and 163 lb-ft of torque, though it does receive a boost from the electric motor. 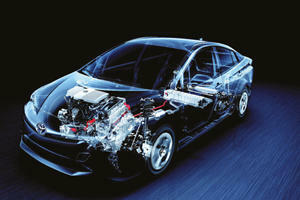 In a surprise move, Toyota has decided to make the hybrid model the most powerful with a combined 219 hp. All RAV4 Hybrids send their power out to AWD through a continuously variable transmission (CVT). In addition to being the most powerful RAV4, the with an estimated 41/37/39 mpg city/highway/combined. In the back of the RAV4, Toyota has provided up to 37.6 cubic feet of cargo space (this number drops slightly with the standard or panoramic moonroof). The cargo area itself is very open and lacks any significant intrusions from the wheel arches. Toyota has yet to determine how much cargo volume is available with the second row folded flat, though we can tell loading large objects into the RAV4 won't be an issue. It's also worth highlighting that the hybrid RAV4 boasts the same amount of cargo volume as its non-hybrid siblings. After driving both the standard and hybrid versions of the RAV4, it became immediately apparent that the hybrid is the one to buy. Not only is the hybrid more powerful than the gas-only version, but it was also smoother as well. We expected the RAV4's new eight-speed automatic to provide a highly refined driving experience but it fell completely flat. Most of the shifts were handled smoothly, though we often wanted the transmission to shift into a higher gear. When leaving from a stop or accelerating up a hill, the cabin was filled with a loud drone from the 2.5-liter engine as the transmission held gears for too long. By contrast, the RAV4 Hybrid felt much more cohesive and its CVT was far smoother. We did only sample pre-production versions of both variants, so perhaps Toyota will make changes to the eight-speed transmission's shift programming for the production version. No matter which RAV4 you choose, steering is very light and requires little effort. The brake pedal also felt incredibly light, requiring a significant press to stop the vehicle. As with the transmission logic, we expect the brake pedal feel to change slightly for the production model. With both the hybrid and gas models, road and engine noise was palpable from inside the cabin. More sound deadening would be appreciated here. Ride comfort was fairly compliant, though we noticed a more busy ride on a test car with the optional 19-inch wheels. As with almost every other car on sale today, larger wheels hinder ride comfort, so we'd recommend sticking with either the base 17-inch wheels or optional 18-inch wheels. We also had a chance to sample both the variants of the RAV4 on an off-road trail. While it's no Range Rover, the RAV4 features several driving modes to help it drive over loose surfaces. The hill descent control worked perfectly to help us crawl down a steep, dirt decline. Few owners will push the RAV4 off-road but it is nice to know it is possible. Pricing a Toyota RAV4 is not unlike building a Porsche 911 - so get ready to hear about a ton of trim levels. The gas model is available in LE ($25,500), XLE ($27,300), XLE Premium ($29,500), and Limited ($33,500) trims. AWD is available on all trim levels for an additional $1,400 and an off-road oriented Adventure trim is offered with standard AWD for $32,900. We particularly enjoyed the exterior styling of the Adventure trim as well as its orange interior accents. The RAV4 Hybrid is available in LE ($27,700), XLE ($29,500), XSE ($33,700), and Limited ($35,700) trims. Compared to an AWD gas-only model, stepping up to the hybrid only costs an additional $800. Since the hybrid already includes AWD and more power, we'd say it's a no-brainer. Toyota estimates that it will only take around two to three years to pay off the additional cost of the RAV4 Hybrid because of the fuel economy savings. Overall, we love what Toyota has done here with the fifth-generation RAV4. Dynamic exterior styling akin to a mini-4Runner is married to a cohesive interior design with plenty of storage areas and tech features. We came into the new RAV4 expecting to favor the gas-engine model with its new eight-speed transmission, though it was the hybrid model we fell in love with. Toyota expects the RAV4 Hybrid to account for 25% of sales, but we wouldn't be surprised if it's even higher than that. We still had a few gripes with the RAV4, including slightly numb steering, a light brake pedal and a noisy cabin. None of these are dealbreakers, however, and we would still recommend the RAV4. Since we much prefer the RAV4 hybrid, it receives a rating of Great Buy while the standard RAV4 receives a rating of Worth A Look. Which was your favorite Super Bowl car commercial this year?